If you enjoy eating colorful fruits, you'll like stitching them just as much! This free embroidery pattern has a row of sweet produce that you can stitch along the edge of any number of things. And any time is a great time to be thinking about and embroidering fruit. Especially when you can stitch them in a rainbow! Where do you need a fruity border in your life? How about along the edge of a tea towel or on the hem of a child's t-shirt or dress? You could try enlarging the design to add along some curtains for your kitchen. They're also a fun companion with other summery border embroidery patterns! Of course, you don't have to only use the pattern in its entirety. Individually, these fruits would make adorable patches or pins. Choose one fruit and stitch it tiny, then place it in a tiny hoop! Now, grab your supplies and start stitching something sweet! To use this pattern, start by downloading the JPG file. When printed in landscape orientation with page scaling set to "fit" it should fill the longest side of the page and be about 10in wide. You can also print the pattern and enlarge it further on a copier/scanner to make a bigger border. Do this in sections, and then line them up to complete the border. You may also do this to use the fruits individually. If you want to make a longer border, simply repeat the pattern, fitting the watermelon and plum close near each other. The flowers and dots will help make the pattern look seamless. Use the printed pattern to trace or transfer the design onto your material. You may also find that it's easier to print on water-soluble stabilizer because there's a lot of little lines in this pattern. The fruit are arranged so that they can be embroidered in a rainbow, as you see in the guide above. But you shouldn't feel locked in on those colors. Choose colors that work for the types of fruit in the pattern. But you'll find that some of the fruit can be different colors, for example, the apple, citrus and pear. Even the plum could become a peach! Or, instead of using bold and bright colors, try working the design with more muted or pastel colors...or even using the design for redwork! Simple stitches worked with 2-3 strands will do well on this pattern. Try back stitch for the outlines, detached chain stitch for the seeds, flowers and tops of the pineapple and strawberry, simple straight stitches for the detail on the pineapple and french knots for the tiny dots. Or use your favorites! If you are embroidering on an item that will be washed, be sure to secure your thread when you start and stop. 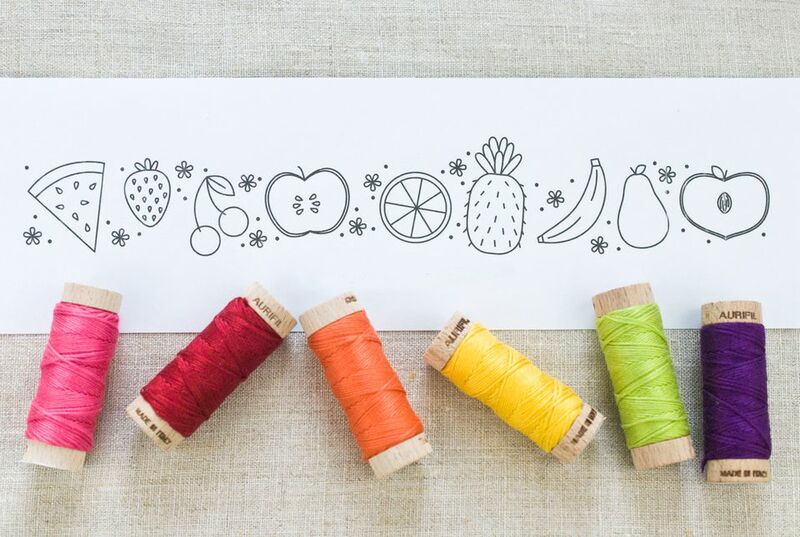 The most important thing is to have fun stitching up your fruity embroidery! Note: This pattern is designed for personal and cottage-industry use. Please do not sell the pattern or mass-produce items made using this pattern.